So wheat harvest got going this week. It has been hot and dry so the plots are ready. You’ve seen this many times before where the scaled cart follows the combine from plot to plot. The yields have been very good, over 100 bushel dryland. But recall we had a wet spring that was of benefit to growth and development. So after all the tests are harvested we will summarize the data and learn of our success. (I’m always an optimist). But the hot and dry part that’s good for wheat harvest is not so good for dryland corn on light ground. This is our organic fertilizer corn test. Always hope for rain when it’s dry, but would like to have this one turn out as it’s our most complete organic test ever. But you can’t control the weather, just complain about it. So I’m doing that. At least I haven’t had to mow my yard for several weeks. See, that’s an optimistic view. So last week, Senior Sales Manager Galynn, SAM Rob and I went down to Hopkinsville, KY to visit the Security Seed &amp; Chemical Research Farm. It is a large facility where fertilizer plots are established each year to test different program, both old and new. Fertilizer Agronomist Lang French met us at the plots to show us around. AgroLiquid has been a standard program there for quite a few years now. But that is challenged each year. They do have really good looking corn down there. The corn is in the silking stage now. Here is a plot that received a preplant application of dry fertilizer (9-23-30). And right next to it is a plot that instead received a planter application of Pro-Germinator + Micro 500. Notice that the silks are turning brown indicating that it is farther along in maturity. Lang said that they often see tassel emergence at least seven days earlier with AgroLiquid compared to dry treatments. One of the many features explaining the high performance of AgroLiquid. Go to their upcoming field day if you are in the neighborhood. And if you want to see a video discussion of these plots (and who doesn’t?) go to @DrJerryCropDoc on Facebook. So how fast does corn grow anyway? I recently read an article in a Pioneer update that told about spraying a stalk with paint and then checking it the next day. I shared this my friend Chris Cook who farms in SE Wyoming and thought it would be a good project for his young boys Brady and Matt. And it was! I got this pic right back from them showing the amount of growth overnight. Pretty phenomenal. Of course this corn had the advantage of using AgroLiquid. But I’m pretty corn with other fertilizer would grow at least some in the same test. Maybe. So I have showed pictures of Dr. Zouheir and his various nutrient capture studies. Of particular interest is the nitrogen experiments where he captured ammonia as it volatilized off the soil surface from different N treatments. Well all of those were practice leading up to this big one. After surface applications of different sources and “stabilizers”, he will measure volatility, plus leaching, soil persistence and crop uptake. We did this on Friday, and there are Zouheir and MSU MSU intern Jenna getting the passive capture devices all set. It was hot Friday, but nothing like this weekend’s oppressive conditions. But Zouheir will be out there to collect samples for a 24 hour measurement. 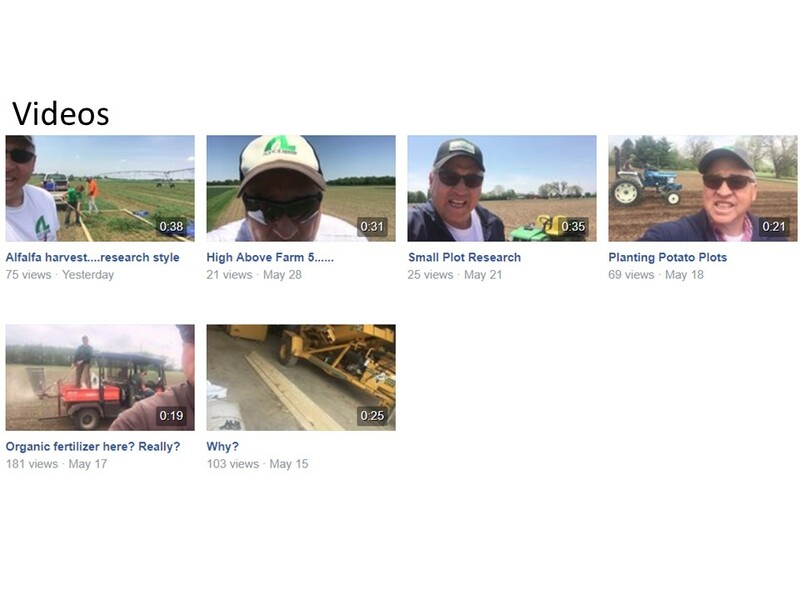 Also, I know you are questioning our planting corn at the end of June Well we had hoped to start earlier but work and weather caused delays. And he is the only one qualified for this type of work. We will mainly focus on corn uptake of nitrogen as it grows. We certainly won’t be able to harvest this. But these same treatments have been applied for yield over the years at the NCRS anyway. I don’t usually like to expound on tests before the outcome is determined. But I’m confident! And this is high tech such that there is no other work like this anywhere. So one more post from the Palouse in SE Washington. We have a field trial with a grower and Eric and I walked it last Wednesday. This is soft white winter wheat and it is looking good. The heads are filling grain now, and grain protein is being made now too. Yield and protein determine payment to the grower. Outside of weather, one thing that can affect yield is insects like aphids. And here they are. I believe these are Russian Wheat aphids. (Someone will tell me if they are not.) I just happened to get this picture that is interesting. I believe that larger brown one is what is referred to as a mummy, having been stung by a parasitic wasp that laid eggs inside. The insect world isn’t pretty. These aphids are sucking leaf juices and can cause the leaf to turn yellow. And this is the flag leaf, the energy leaf of the plant. So there is a threshold. It is an average of 20 aphids per plant at this stage. This according to his crop scout. So this field wasn’t there. (I read where other experts say as many as 50 is threshold before damage exceeds cost of control.) But the grower was nervous about not spraying. Then there is the cost of the product (Dimethoate) and a plane. A good yield is on the line, but wheat prices aren’t the best. The field was pretty slick with aphid juice. Too bad the wasps didn’t do more. Not sure what he ended up doing. No one said farming is easy. And if they did, they are wrong. So I have been to the Palouse Region of the Pacific Northwest numerous times. It is made of rolling hills that contains fertile soil for growing a variety of crops, but mostly Winter and Spring wheat, peas and lentils. It is in SE Washington, W Central Idaho and down to NE Oregon. It is home to several AgroLiquid Retail Partners as well as some research trials. But I had never been to Steptoe Butte. It rises 3600 feet above the farmland, and is made of quartzite that is over 400 million years old. The underlying rock of the surrounding land is Columbia River basalt that is only (!) 7 to 15 million years old. So it’s been there a while. I was with SAM Eric and he hadn’t been up there for a while. I’m always anxious to see the sights. I didn’t think it looked that high up from below. But I changed my mind as we went up, and it took a while. From the top, the views were spectacular. There used to be a hotel on top in the late 1800’s. I couldn’t imagine going up there by horse and wagon. The builder hoped to increase tourism, but after a few years it had to close as the people just didn’t come. It is a long ways from anywhere, other than the good farmland. About halfway up there was the edge of a wheat field. I thought it would be scary farming on those lower hills, but this is ridiculous. I would be too scared to look around driving a tractor or combine on this slope. So that was fun. We continued up to Spokane and I came home. 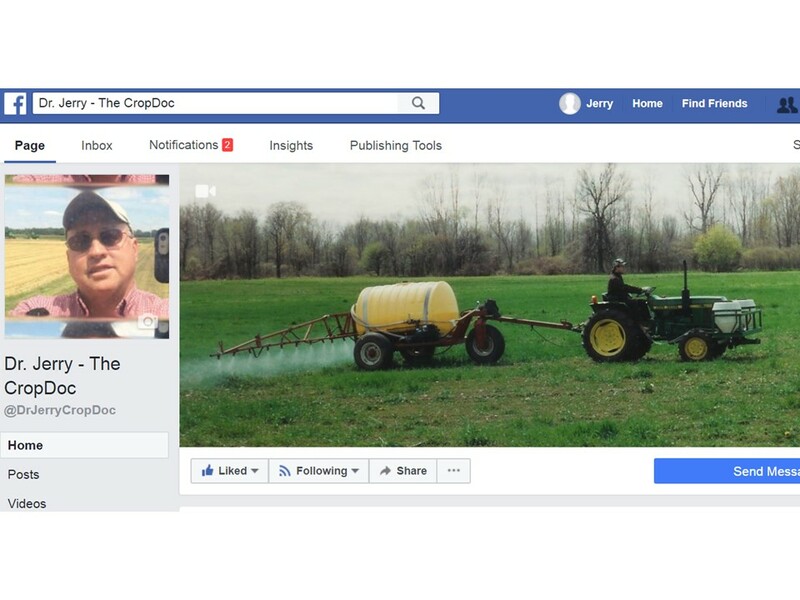 By the way, be sure to check out the research facebook page: @DrJerryTheCropDoc. You don’t have to be a facebooker to visit. So when you think of farming, there are usually images of corn and wheat that come to mind. But all of the produce that is used across the world comes from a farmer. And that includes grass seed. Imagine trying to plant a yard or football field and there was no grass seed! Well farmers grow that too, and most of the cool-season grass seed is grown in the Pacific NorthWest, mostly in the Williamette Valley South of Portland. There are all sorts of fields growing seed for planting. One issue in it’s production is keeping it standing. A Plant Growth Regulator (PGR) is commonly used to keep the stems erect during pollination especially, and then still keep the grass from laying flat on the ground after pollination to enable a better seed harvest. But PGR is expensive and some grower try to cut back. Here is a field of Perennial Ryegrass seed that is laying pretty flat several weeks now before harvest. Contract researchers are businesses that will do replicated plot research for a variety of agricultural clients, like fertilizer producers. Hal Lewis is one of the first of these with Precision Ag Research in Amity, OR. Hal mostly concentrates on grass seed production plots and has a variety of tests in place. Here is SAM Eric and Hal on Wednesday reviewing our test plots. Here is a view across several plots. The objective is to keep the grass more or less upright. It will fall over as the seed head develops. But you don’t want it flat to the ground, as that is, well, just not acceptable We are encouraged by the addition of a certain potassium product at the time of PGR application. That’s all I’ll say till after harvest. There are also plots with Tall Fescue grass. I must say that I have never been to a research facility that is so dedicated to one crop like grass seed production. Hal knows his stuff and it is an impressive layout. A PGR application is part of Tall Fescue production as well. Here is a plot with a favorite K product looking just fine. So harvest is just a few weeks off and I am waiting with a worm on my tongue (bated breath, thanks Mork) to see how they turn out. If you hear from me later on this, then the results were good! So the joke is that you get average weather data by averaging last year’s drought and this year’s flood. Such is the case in Montana this year. When I was there last week there was plenty of water everywhere. Glad I brought my rubber boots. Not for wading in the rivers, but for walking in fields like this one here. Water was looking for places to go. Sometimes finding other types of low ground, like this basement. But it looks like he is prepared. No doubt an expert after weeks of this. It’s been wet over a large part of the country. But Mother Nature likes balance, and there are still areas looking for rain. Like Western Oklahoma. But Mother Nature is still a maaaad scientist! So it has finally happened. I have never been on the Facebook, being solely devoted to the Land of Liquid Blog. But some of our crack Marketing staff thought I should branch out as the Facebook reaches far more people. What? Well I finally relented and gave it a try, going kicking and screaming into the twentieth century. It started last week and I am still getting the hang of it. But I can post short videos, pictures and comments of what is happening at that time in research. Check it out and tell your friends. Here is a snapshot of the Homepage with the name on it. I didn’t choose it, but it’s growing on me. (Like a rash). That picture? It’s me spraying quackgrass (Agropyron repens) at the NCRS in the spring of 1994. The videos are fun, and short. That’s my favorite part so far. Now Stephanie also posts on the NCRS Facebook. We’re not in competition (I hope.) Just a different slant, and this one will follow me around the country when I do actually go someplace. So give it a look and you’ll be hooked.